The country of Vietnam had always a “label” around his neck even before the tourist came here to explore the land – and this was not always very positive. First there was the war with the France, then the Americans were here which ended up with thousands of “boat” refugees. For years the communistic country of Vietnam was boycotted by the West – not only by the U.S. but also many European countries. The last years the country is “booming’ although still communistic or social whatever you want to call it. Vietnam is young, wild and willing; in the streets commerce is everywhere although the government preaches Marxism, the economy is capitalism and nothing else. Vietnam exports more coffee than Brazil , more rice than Thailand and the country is in the last 10 years in every top 10 concerning fastest growing economies in the world. Next to a very driven and interesting history the country has got a very diverse landscape with high mountains, wild rivers, sandy beaches, rice terraces and a huge delta. “Ho Chi Minh City” and “Hanoi” are metro poles while “Halong Bay” is to be considered one of the top touristic sites of South East Asia. A very small strip of land on the edge of the continent of Asia is definitely worth wile visiting. Everyone knows at least one Vietnamwar movie but how did het Americans end up in this part of the world and why did they leave? 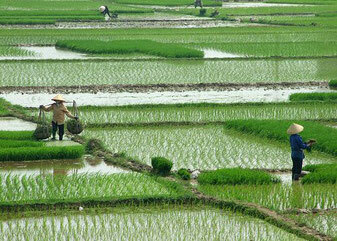 The history of Vietnam is considerably much longer and is mainly dominated by a 1000 year Chinese rule. The country became one and an Emperor was chosen as a leader of Vietnam; officially till 1945. The Mongol horde was defeated in the North of Vietnam but in the 16th century the first Europeans stranded on the beach in Danang – ironically at the same stretch of sand where decades later the French and later the Americans came in. The French would colonialize Vietnam in the 19th century together with Cambodia and Laos and would name it “Indochina”. In WWII Vietnam was occupied by the Japanese but there was no battle. 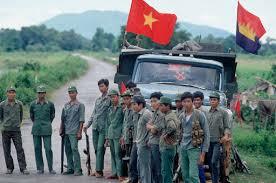 The French were determined to get the country back after the war but the Vietnamese were to be independent. The result was a bloody war that ended with the French defeat in 1954, in Dien Bien Phu. The country was split up and while the communistic north was supported by China and the Soviet Union the South was by the United States. This ended up in the Vietnam – or American war. After the American troopers left the communists took over the country and founded the united Social Republic of Vietnam. In het south of Vietnam there is the mighty “Mekong-delta”, which is a very big area that’s also referred to the rice bowl of the country. 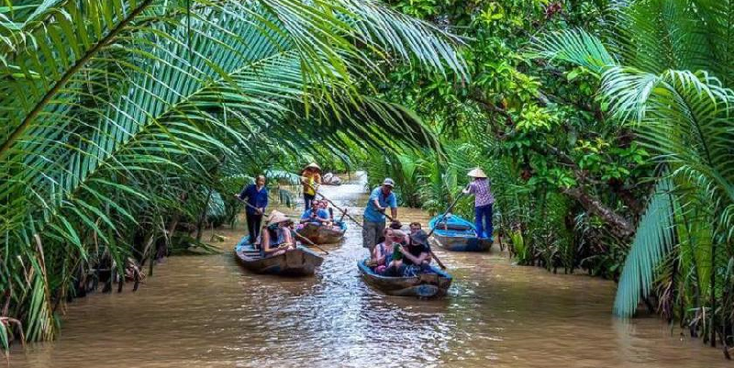 This is one of the most populated areas of Vietnam and in the world and full of little and big canals, rivers and islands. “Ho Chi Minh City” or the old “Saigon” is a conglomerate of millions of people, the big economic drawcard of the country and has got some very interesting “war” sites next to other places. The central part of Vietnam is probably the most fascinating part concerning diversity; beautiful sandy beaches with white sand and waving palm trees, but also old “Cham” ruins, the Central Highlands and the Colonial city of Hoi-An that survived the war tremendously intact. The old Emperor capital “Hue” and the “DMZ” are also in the centre of the country with the old border between North and South Vietnam. You can make a tour to all the old American military camps that once were part of the “McNamara” line during the Vietnam war. 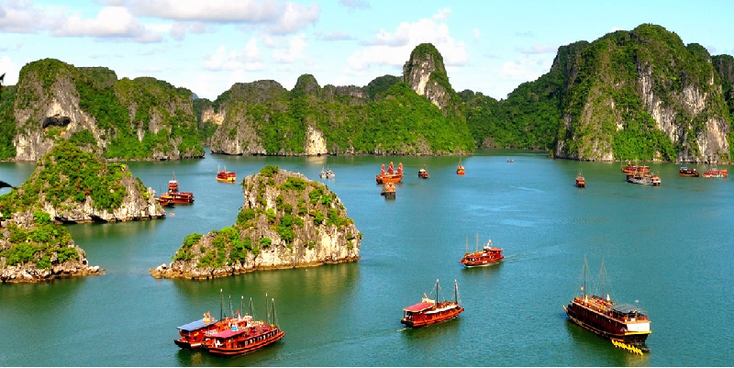 The biggest draw card for tourists has to be “Halong Bay” in Northern Vietnam – a bay full of pointy Limestone mountains and hills with sandy beaches, little “green” islands and surrounded by amazing blue waters. A boat trip through this wonderful and unique UNESCO worldheritage area is a definite must. This very photogenic landscape you can also admire on land in Vietnam; between the capital of “Hanoi” and the city of “Ninh Binh” there are lots of opportunities to take a better look at his spectacle. 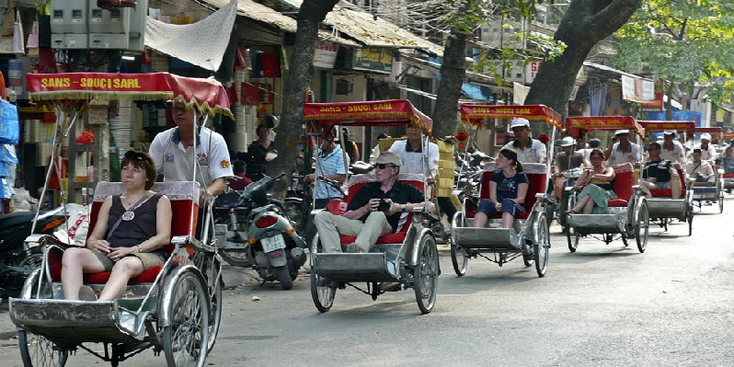 Many people will mention “Hanoi”, the capital city of “Socialistic Vietnam”, the classic lady of the Orient and or the pearl of Vietnam should also not be missed. “Cyclo’s” (bicycle taxi’s) find their way into the crowded narrow streets in the old quarter next to thousands of scooters, busses and other traffic. Another highlight of the city is the mausoleum were the “Father of Fatherlands” is balsemed; “Ho Chi Minh”.